In celebration of the 2014 New Year, Carbon Poker, on Sunday, January 26, 2014, will be holding a $10,000 value added tournament called the $10K Dollar Frenzy. For this special tournament event, Carbon Poker is adding $10,000 to the prize pool created by players’ buy-ins, which means the actual prize pool will be significantly higher. It’s called the Dollar Frenzy because the buy-ins is only $1 and there is no fee. Further, that $1 buy-in can be paid in the form of cash, and entry coupon, or VIP Points. The entire buy-in for this event will go into the prize pool. The event starts at 16:00 Server Time. 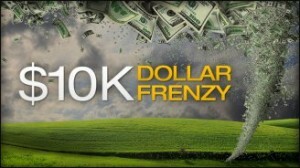 You can even get in on the Carbon Poker $10K Dollar Frenzy for free by winning your seat at one fo the daily $10,000 Dollar Frenzy Freeroll tournaments. They take place at 19:00 Server Time daily and at each event, 25 seats in the $10K Dollar Frenzy will be awarded. Registration for this event opens 30 minutes before freeroll start time, and only 250 players will be permitted to register. What’s more, also in celebration of the 2014 New Year, in addition to Carbon Poker’s regular weekly Sunday Big Ticket $100K Guaranteed and Sunday Big $11 – $10,000 Guaranteed events, on Sunday, January 26, 2014 the site will be adding two more tournaments to the schedule with the same guaranteed cash prize pools. In preparation for these events, Carbon Poker will be holding, on Saturday, January 25, 2014, two Sunday Big Ticket Qualifier tournaments.